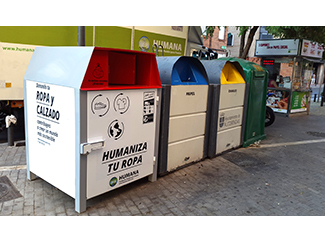 The Foundation is updating its typical container for used clothing and footwear: it keeps the green and premiered new adhesives with a clear call to action: 'Donating your used clothing and footwear you are contributing to a more sustainable world' and a message 'Humanizes your clothes'. 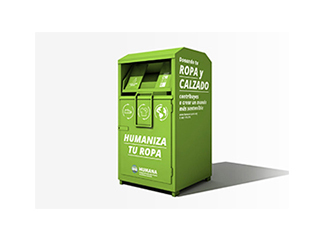 The new image gradually is being implemented in the 5,200 containers that form the Humana textile collection network. The implementation is being carried out in two basic types of container being used: the traditional Easy-Push, as the model released in 2014, which represents an important step forward in security and usability for donors. In both cases, the capacity is 2.5 cubic meters. Offer protection against adverse weather conditions, all edges are rounded or polished to avoid living or sharp edges, the building material is not flammable and prevent a possible spread of fire inside to the outside of the container and is resistant to corrosion.